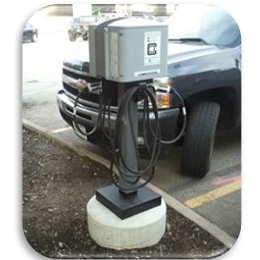 In acknowledgement of Sinclair's ongoing sustainability efforts, DP&L has partnered with the college to install a charging station for electric cars. Located in the parking lot of Building 20 just west of the Fifth Street bridge, the station can accommodate two cars at a time. The 240 Volt system is available at no cost to users on a first come, first serve basis to any faculty, staff or student authorized to park in Sinclair's parking lots. Hybrid technology has been part of the instruction in Sinclair's Automotive Technology program since 2008, and this complimentary service to our employees and students is a natural step in our mission to put new technology and education into action. For more information or questions regarding the charging stations, please contact Facilities Management at 937-512-3090.